Dove brand of Unilever needs no introduction. It is a hugely popular international beauty brand. Dove has recently launched an entire range of baby products. 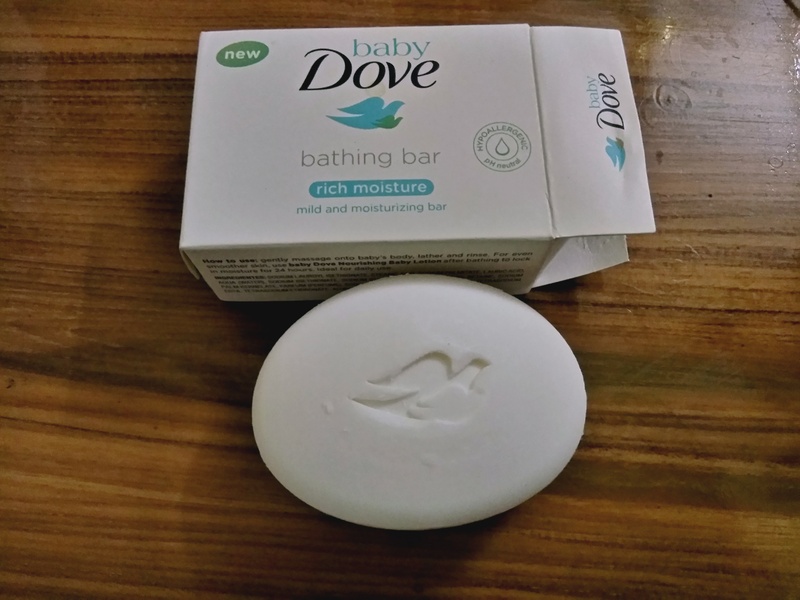 What Baby Dove Rich Moisture Bathing Bar Claims? In the first few months our baby’s skin is continually developing, so as well as being as soft, it’s also super delicate. Baby’s skinis 30 percent thinner than ours, so it’s more vulnerable to damage and drynessand their skin barrier is weaker too, which means baby’s skin loses moisture upto five times faster than ours does. That’s why the best baby bath soap should give your baby’s skin the gentle care it needs. Baby bath products should offermore than just mild cleansing they need to ensure the healthy development ofyour baby’s skin too. Sodium Cocoyl Isethionate, Stearic Acid, Sodium Palmitate, Lauric Acid, Water (aqua), Sodium Isethionate, Sodium Stearate, Cocamidopropyl Betaine, Sodium Palm Kernelate, Perfume (Parfum), Sodium Chloride, Zinc Oxide, Glycerin, Tetrasodium EDTA, Tetrasodium Etidronate, Alumina, Citric Acid, Titanium Dioxide. Price- Rs.27 for 50gm , Rs.48 for 75gm. Effectively cleanses gently without drying and have a moisturising effect. Mild soap with neutral pH. Hypoallergenic and suitable for all skin types. Can be used by adults too and is safe for sensitive skin. It lasts for quite a long time. My Suggestion – Wash your baby’s eyes after bathing. It’s a good baby soap and must be tried . It would definately give good competition to other baby soap brands . 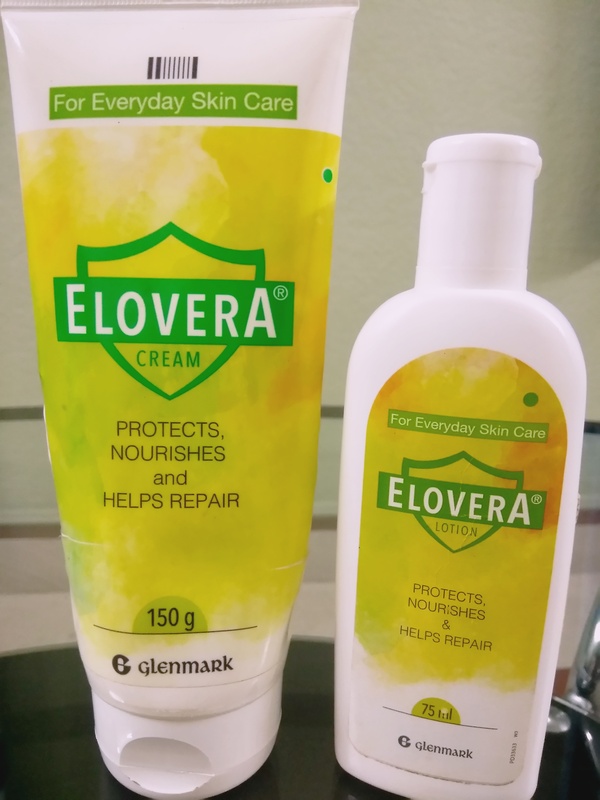 Elovera cream / lotion from Glenmark pharmaceuticals is a moisturising cream / lotion best suited cream for dry skin, to reduce scars , dark spots and marks. This cream / lotion has Aloevera extract, vitamin E. This cream/ lotion lightens the marks caused due to environmental changes , dust & dirt caused by pollution. It gradually reduces the marks with regular use. 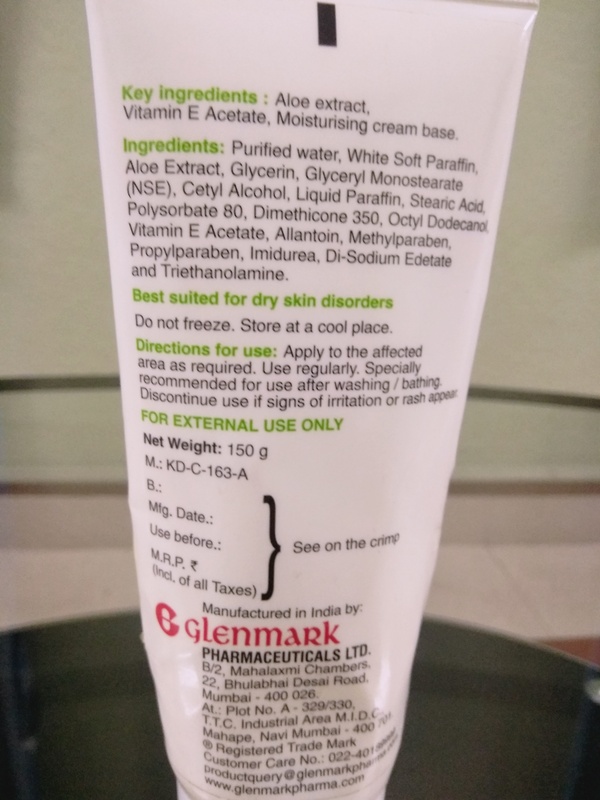 This cream / lotion is recommended in dry skin, dermatitis, hyperpigmentation resulting from chronic exposure to allergens , irritants, environmental changes, smoking or from skin problem in condition like psoriasis , atopic dermatitis , eczema, xeroderma, stretch marks, post acne marks, post pimple scars, freckles and other skin stains . Directions – Apply the cream / lotion after washing your face or after bath as required on the affected area. Use regularly for better results. Don’t freeze. Store in a cool place. ** Use under medical supervision. 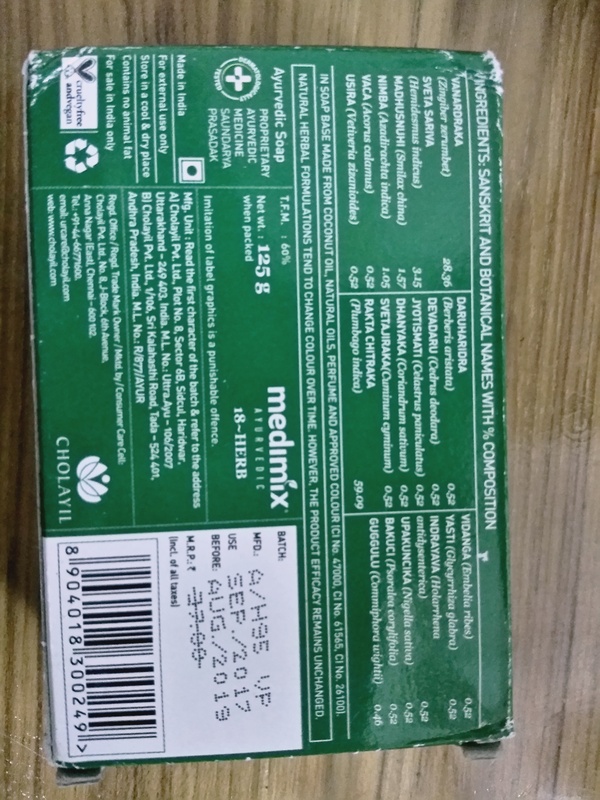 Cream ( 75 gm – 215 INR, 150 gm – 297 INR ) Lotion ( 75 ml – 193, 150 ml – 355 INR ). 💮 It is the best cream or lotion for dry and dehydrated skin. It actually absorbs in the deeper layer of skin and heals the skin from deep inside. One would start noticing improvement within a week. This cream / lotion enhances the moisture retention capacity of skin and makes it soft, supple, firm and glowing and has a faint smell. The cream has thick consistency and the lotion is runny and both spreads easily. This was recommended by my dermatologist. 💮 It lightens acne / pimple marks , mild scars, stretch marks. It makes skin even toned and removes tan to an extent. 💮 It is non comedogenic and hypoallergenic and won’t block pores. 💮 Easy availability and reasonable price. 💮 It has chemicals…!! But , they are clinically safe. People with acne or pimples or oily skinned should avoid the cream as it is bit heavy , but they can use the lotion safely throughout the year . It can serve a very good night cream . The lotion is very well suited before makeup. It is almost an all in one cream. 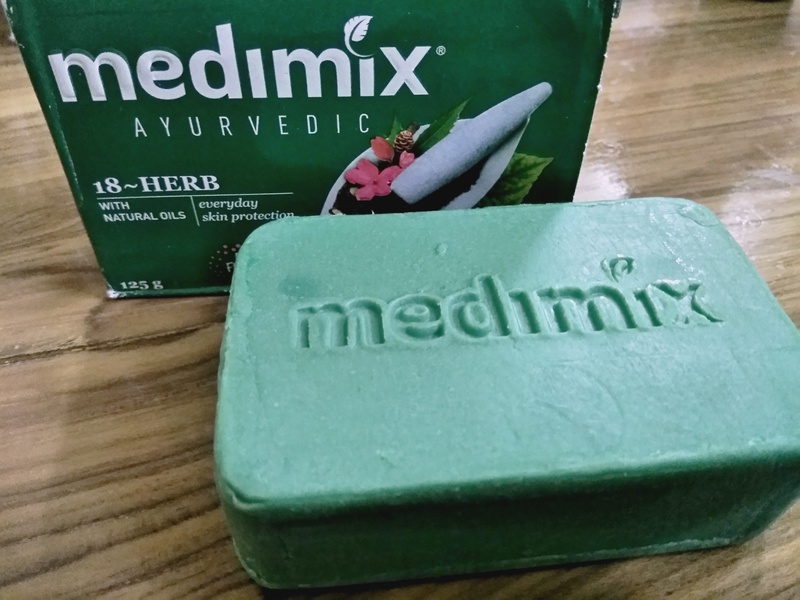 Medimix is an Indian brand of ayurvedic/herbal soap manufactured and marketed by Cholayil Private Limited, a Chennai based company. It’s one of the highest selling soaps in India. Guggulu,Devadaru,Nimba Twak- Prevent skin infection. Chitraka, Dharu Haridra- Cleanse you skin to combat pimples. Vacha, Jeeraka, Krishna Jeeraka, Chopchini, Sariba- Control body odour and lend fragrance to your skin. Usheera,Dhanyaka, Sariba- Prevent prickly heat. Jyothishmathi, Vanardraka, Bakuchi, Yashtimadhu- Improves smoothness of skin. A pure natural & vegetarian soap, free from harmful chemicals. It creates a thick, light greenish lather and has a nice smell which lingers for quiet a long time. It’s a great soap for skin problems like pimples, rashes, itching, body odour , prickly heat, boils, dandruff etc. I personally use this soap for my acne prone skin. It works great for controlling sebum & acne. It also works great against body and foot odour. It’s a great natural disinfectant soap. It can be used to wash wounds too. It has a bit drying effect on skin. It’s a great soap for oily skinned people and people with acne prone skin. People with dry skin need to apply moisturizer / body lotion after its use . One can also use this soap after an oil massage to counteract the drying effect. This is a recommended soap from my side. 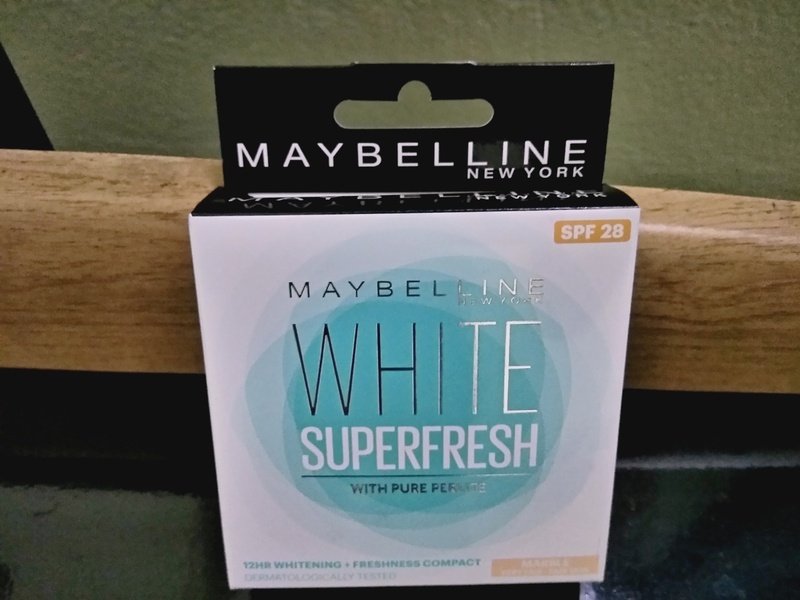 ​What company claims – Maybelline New York White Super Fresh has UV filters that protect skin from both sun darkening and damage. Helps you stay 12 Hr Fair and Fresh. Contains Perlite, a pure mineral that helps absorbs oil and sweat. Gives a naturally perfect-looking complexion. Contains SPF 28 to protect your skin. Suitable for everyday use. Pearl- For light ( very fair ) skin tone . 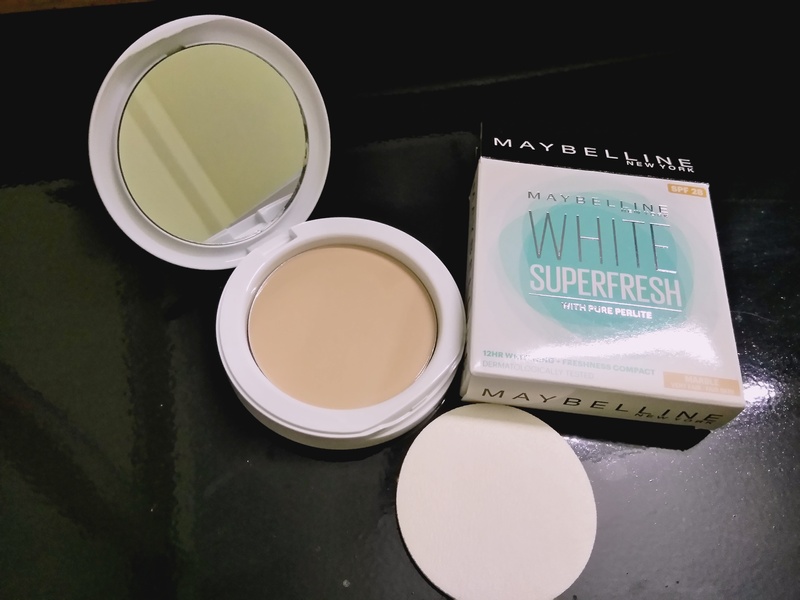 Shell – For medium ( yellowish ) skin tone. Coral – For dark skin tone. Very nice packaging with mirror and good quality puff inside. It has a very smooth texture which easily blends with skin and does not clog pores ( non – comedogenic ). Suitable for all skin types ( dermatologically tested ) and doesn’t cause breakouts. No washing , dabbing or touchups necessary and it keeps you fresh and bright throughout the day. Absorbs sweat nicely and doesn’t let your skin gets patchy. It keeps the skin eventone & lively even in humid weather. Price is pocket friendly with easy availability. 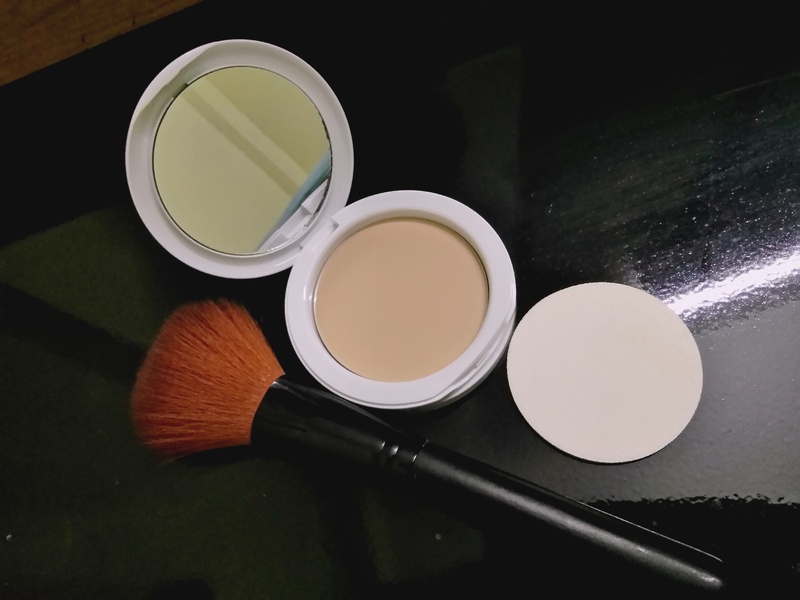 It’s better to use this compact or any other compact with a blush brush for better blending. Price – 8 gm for 150 INR. 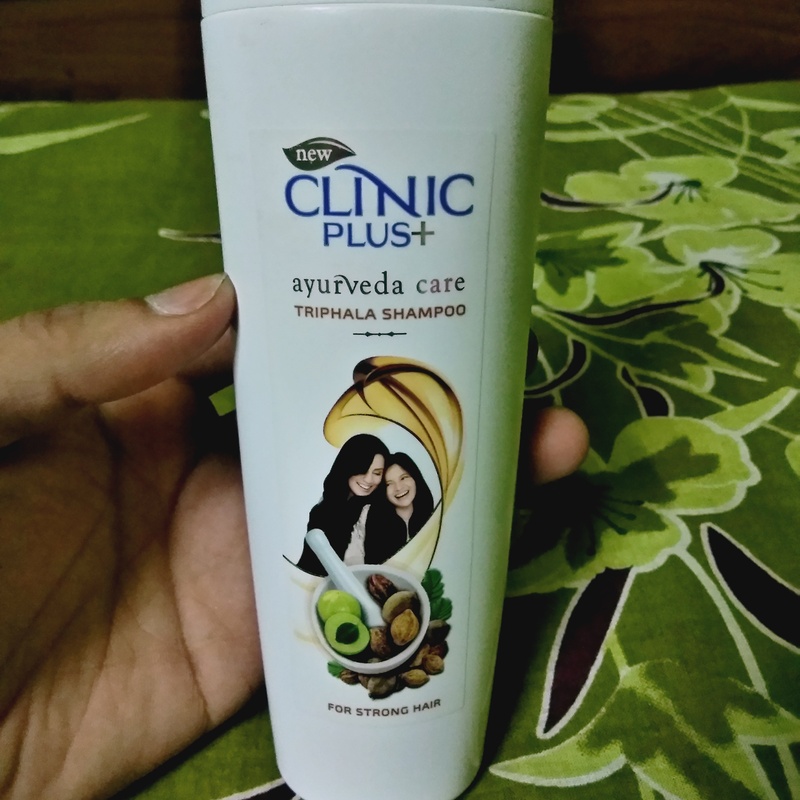 Clinic Plus Ayurveda Care Triphala Shampoo. Triphala Shampoo ( A product of HUL ). Indication – Hairfall and Hair strengthening. Composition – Triphala, Bhringraj, Amla, Reetha, Shikakai , shampoo base , preservatives, colourants etc. Review – Many brands have come out with Triphala shampoo. 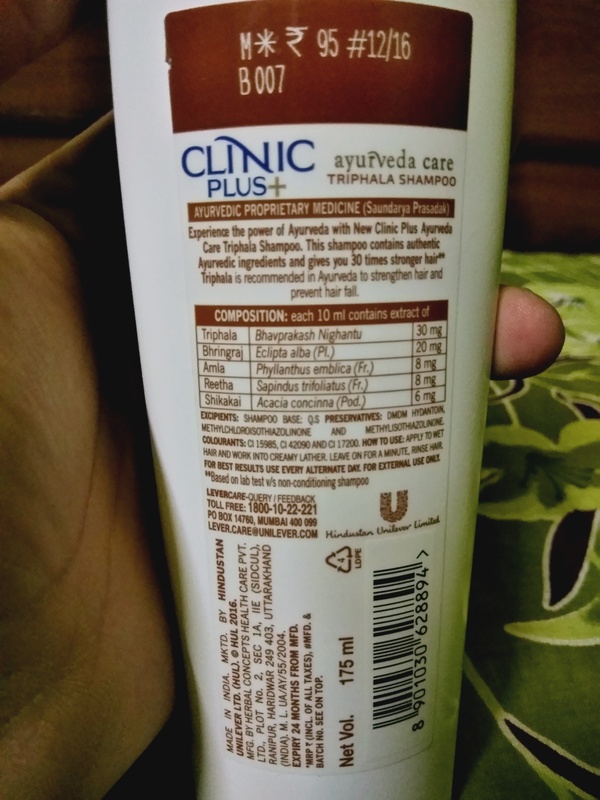 Hindustan Unilever Limited has recently launched this shampoo, which claims to be ayurvedic. A good mild shampoo, one can use it in every alternative day. It creates a good lather and requires a small quantity, and does a good cleansing job. Shampoo is brown in colour and has a mild smell which doesn’t lasts long. It helps in reducing Hairfall fairly but people with dry and brittle hair need to use a conditioner along with it. For oily scalp and hair, this is one of the best shampoo. Price- Price is pocket friendly and it goes a long way. It costs 95 INR for a 175 ml bottle. 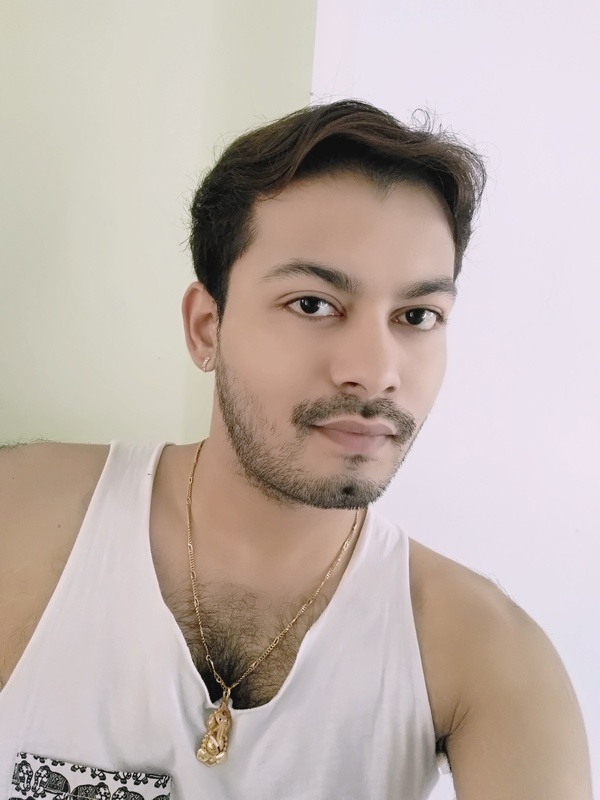 Author saumikkar2017Posted on August 30, 2017 October 11, 2017 Tags Hindustan Unilever Limited # Clinic Plus # Instagrambloggerkolkata# Kolkatablogger# Skincaretips# Skincarehacks# skincareproductsreview # https://skbeautyhealthandlifestyle.wordpress.comLeave a comment on Clinic Plus Ayurveda Care Triphala Shampoo.